Months ago in Hillman Hospital, Chelsea Nirvana pays a visit to her comatose father where she begins to talk to the unconscious man. Dr. Nirvana had always wanted a boy to carry on his legacy and due to a strange twist of fate; Chelsea has been transformed into a younger version of him. She injects Dr. Nirvana with a poison of his own creation called Solution-X that is untraceable. With her redundant parent out of the way, Chelsea leaves with the Inhabiter to start her life over. At the Donut-A-Rama headquarters of Freak Force, Rapture and Horridus watch an episode of The Jerry Rivers Show. This edition will feature an interview with Joey Finkleberry who is now twelve years old and has been locked up in Stronghold Penitentiary for a couple of years now, even since he surrendered to the authorities for causing mass death and destruction. 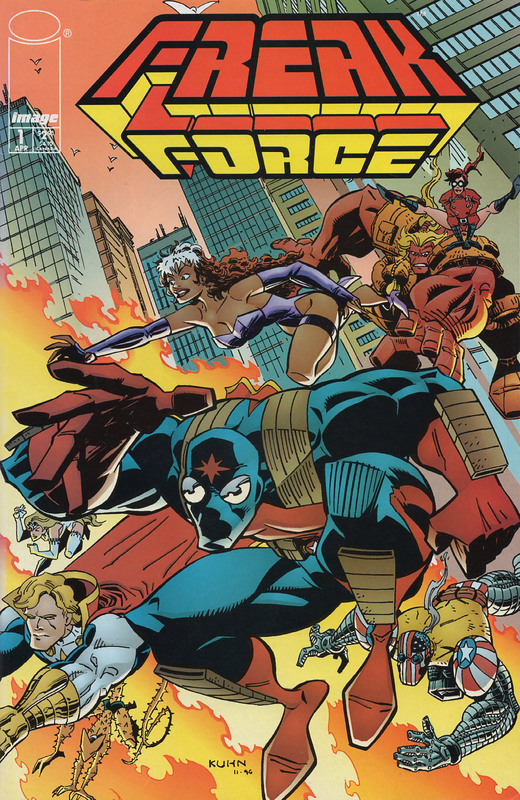 Dart does not approve of this choice of viewing but she is preoccupied with worries about Freak Force’s money issues. Barbaric and Ricochet arrive to inform all of their teammates that they are expecting their first child. Rapture congratulates the couple but warns them about the dangers of giving birth to a super-powered baby after her own child died shortly after birth. The rest of the team are concerned but they all give their best wishes. Barbaric suggests that they could always track down Negate and have him remove any abilities that their offspring possesses. A phone call from Dragon is then received as he requests Freak Force’s assistance in dealing with a disturbance as he is busy at present. The team go up against a dangerous villain called BulkHead who had flown into Chicago specifically confront Dragon. They soon defeat their opponent and are congratulated by a watching Peter Klaptin. He has a business proposal for them and takes them to a mansion that he offers to them as their new headquarters. Peter would like to fund the team but only if Star can be installed as leader and this proposal is accepted. Dart is annoyed by her teammates’ decision and departs with Justice.